Female students were found to be three times more prone to smartphone addiction than their male counterparts, according to a new survey. 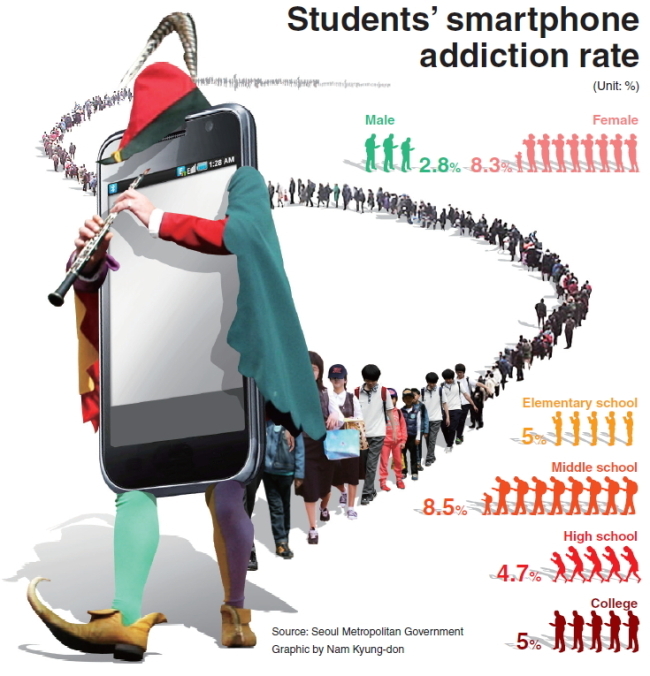 Nearly 6 percent of students were at high or potentially high risk of addiction, according to the survey of 1,600 students conducted late last year by Gangbuk I will Center, a public institution to fight Internet addiction. This broke down into 8.3 percent of female students and 2.8 percent of male students. These students at high risk are hooked on mobile devices an average of 7.8 hours on weekdays and 9.8 hours on weekends. When cut off from the devices, addicts show symptoms of withdrawal, nervousness and tolerance to overuse and experience difficulty in daily life, according to the National Information Society Agency. Around 70 percent of addicts use smartphones mostly for chatting on mobile messengers. “So far addiction to online games or the internet has been a problem largely with male youth. But when it comes to smartphones, girls are exposed to a higher risk,” the agency said. By age, middle school students showed the highest rate of addiction with 8.5 percent followed by elementary and university students, with 5 percent each, and high school students, 4.7 percent. The survey also showed a link between mental health and overuse of mobile devices. Of those who had deep depression, 14.5 percent were addicted to their smartphones, while the rates were 7.9 and 3 percent, respectively, for those with mild symptoms of depression or no depression. Of those with severe anxiety, 21 percent were at risk, while 13.3 percent of those with high anxiety and 4 percent of those without anxiety were found to be addicted. Setting a time limit and regular checks are seen as effective in preventing addiction, but more than half of parents do not control their children’s smartphone use. “The city will step up efforts to reduce smartphone addiction among youth with monitoring, counseling and programs for parents,” said Byeon Tae-soon, the director of the city government’s children and youth division.